Sprawled around Mysore are hectares of land known to naturalists as scrublands. To real estate developers, however, they are ‘wastelands’, fit for nothing but ‘development’. These important natural ecosystems, which support rich biodiversity and maintain the health of the water table, are being turned into residential layouts, industrial estates and software parks. Before long, they will be wiped out without a trace, and without measure of what has been lost. 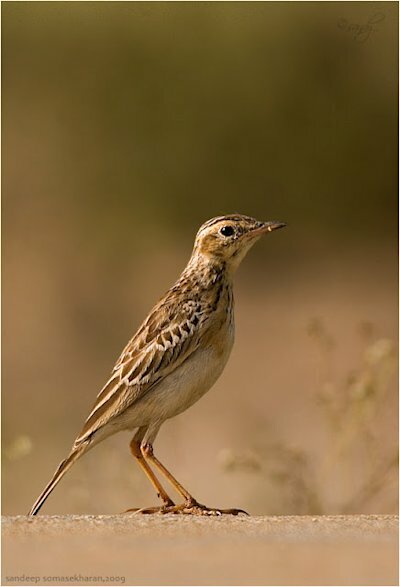 A lark in Mysore’s disappearing scrublandsTo a layperson, scrublands connote territory that is laid to waste. Dead, deserted places to stay away from. But that impression deserves to be tested. Scrublands, in fact, are dry, open spaces with a thin layer of surface grass, occasional shrubs and small, hardy trees such as acacias. Visit one such landscape after a shower, and the green grass has a carpeted appearance. A few months later, everything turns golden-yellow and then brown. But the terrain still looks deserted and inhospitable, until you stop for a while and look keenly around you. Prepare to be surprised by the abundance of life. Larks rise up with a series of whistles and float down on outspread wings. Flocks of pipits erupt like clouds of undulating dust. Mornings and evenings, grey francolins rend the air with crescendos of “katri chor …katri chor”. And if you make yourself invisible, you can see them emerge and dawdle about. Your slightest movement is enough to make them scamper away, shaking their heavy posteriors, and take cover. Calotes lizards soak up the sun, sitting on rocks with their heads raised. Spotting them, Black-shouldered Kites, Shikras and Short-toed Snake Eagles swoop down for the kill. A few steps on the grass disturb tiny blue butterflies, which take off and settle a few paces away. 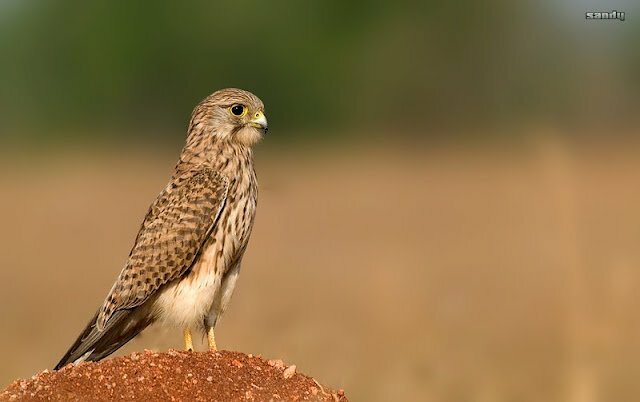 A female Kestrel looks out for prey in Mysore’s disappearing scrublandsBlack ibises dig their curved bills deep into the earth, looking for grubs, worms and insects. Quails wait until you almost step on them before whirring up in a startling escape flight. Winter beckons harriers, kestrels and Booted Eagles to take refuge in these habitats, as they take flight from the cold of the northern territories. Jackals, foxes and hares can be spotted, often with stray dogs in hot pursuit. 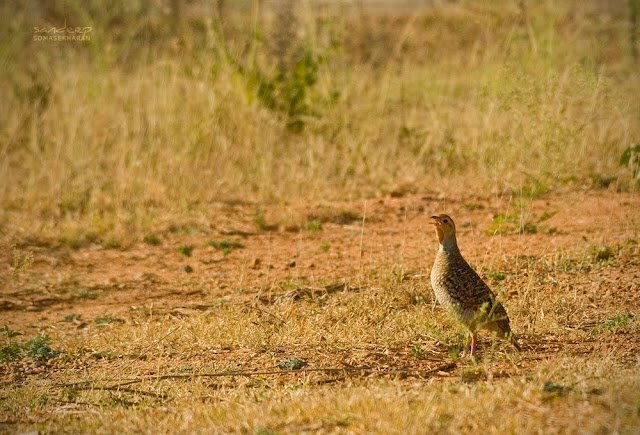 A Grey Francolin calls in Mysore’s disappearing scrublandsOutside Mysore’s Ring Road, there used to be a continuous, uninterrupted belt of scrublands. These have slowly started getting converted to residential layouts. Earthmovers scour the soil and roads are laid. Electric poles are erected. Drains are dug. And it’s not long before the buildings come up. 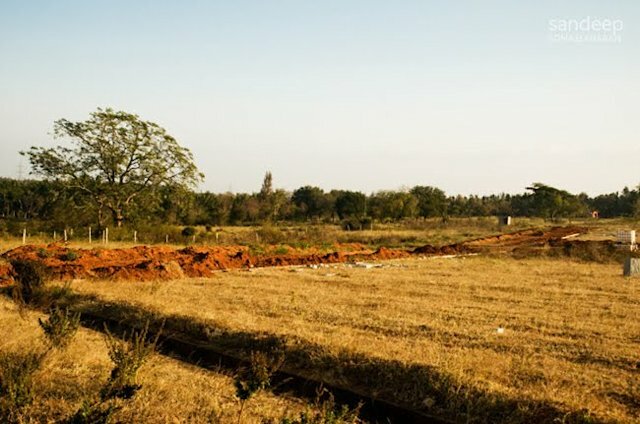 An earthmover excavates in Mysore’s disappearing scrublandsStill, some life persists amidst this chaos, only to be driven further away. At times they are cornered from all directions with no place to go. Each year, the number of birds seen in these scrublands has declined. So have the scrublands themselves. A section of Mysore scrublands after excavationNext year, maybe the birds coming this side from the north might be in for a rude surprise… It really seems to be sunset for Mysore’s scrublands. 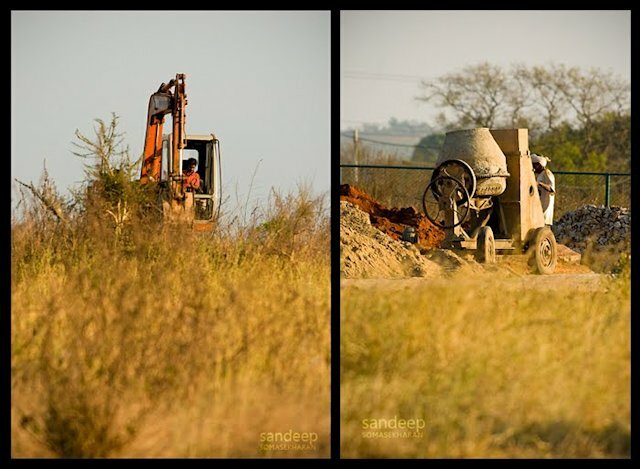 Sandeep Somasekharan is a software professional and photographer based in Thiruvananthapuram. He spent the better part of the last decade in Mysore, Karnataka, where he used his spare time to document the city’s nature, birds, trees and urban wildlife in photographs. He writes at The Green Ogre. This entry was posted on May 18, 2012 at 1:38 AM	and is filed under India Forgotten, Pollution. Tagged: Beauty, birds, destruction, humanisation of the environment, Mysore, nature, Pollution. You can follow any responses to this entry through the RSS 2.0 feed. Both comments and pings are currently closed.